Caravan Canopy's Middle Zipper Sidewall offers easy access to a fully enclosed canopy. Made of 100% Polyester fabric and includes a vertical middle zipper, this combination is perfect for anytime you need maximum enclosure and easy access to your canopy. CPAI-84 compliant. Price stated is per sidewall. 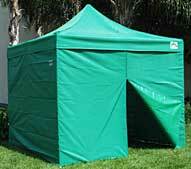 I need sidewalls to go with my recent purchase of a Caravan Aluma 10' X 15' Canopy with Professional Top. For the 10' side, I was thinking of getting the 10' middle zipper sidewalls, and for the 15' side I was going to get the Caravan Polyester Sidewall - 15' Professional (500 D), but I'm not sure if it's the same material. Is the zippered sidewall also 500 D? The Caravan Pro walls are the 500 denier, just as the top fabric. The 10' middle zipper Pro wall, and the 15' Pro wall are the same denier. Does this wall attach to the other walls with a zipper. Yes, they zipper together at the edges. Does it unzip at the top as well? Yes, they do. You would be able to unzip it all the way and have only half of a wall up.